Almost daily, headlines announce newly discovered links between cancers and their genetic causes. Science journalist Jessica Wapner vividly relates the backstory behind those headlines, reconstructing the crucial breakthroughs, explaining the science behind them, and giving due to the dozens of researchers, doctors, and patients whose curiosity and determination restored the promise of a future to the more than 50,000 people diagnosed each year with chronic myeloid leukemia (CML). It is an astonishing tale that will provide victims of other cancers and their loved ones realistic hope that cures may yet be found in their lifetimes. 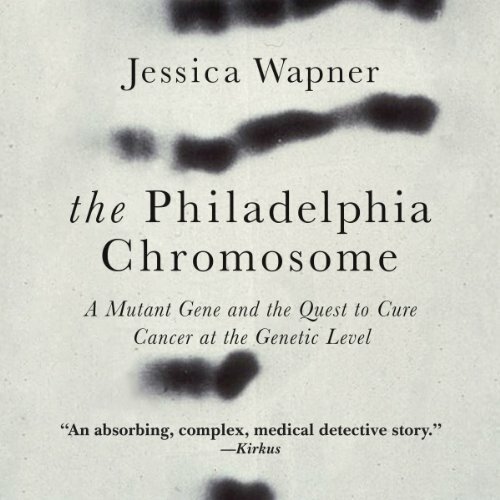 The Philadelphia Chromosome charts the milestones that led to present-day cancer treatment and tells the inspiring story of the dedicated men and women who, working individually and in concert, have sought to plum the mysteries of the human genome in order to conquer those deadly and most feared diseases called cancer. ©2013 Jessica Wapner (P)2013 HighBridge Company. This book details the research and development and treatment for CML patients with the Philadelphia Chromosome defect. I work with cancer patients so I found the book extremely interesting--not overly technical for the lay person, but technical enough to keep me interested and listening with anticipation. If you could sum up The Philadelphia Chromosome in three words, what would they be? Dr Brian Druker.... a TRUE modern day HERO! Have you listened to any of Heather Henderson’s other performances before? How does this one compare? A REALLY good and important book. Inspirational. Criticism? a tad too repetetive. ich wusste nicht, wie spannend die moderne Medizin und Pharmazie ist. Sehr spannende Einblicke in die Geschichte eines revolutionären Medikaments.